Posted: Sun Aug 07, 2016 8:21 pm Post subject: What variety of Cotoneaster is this? 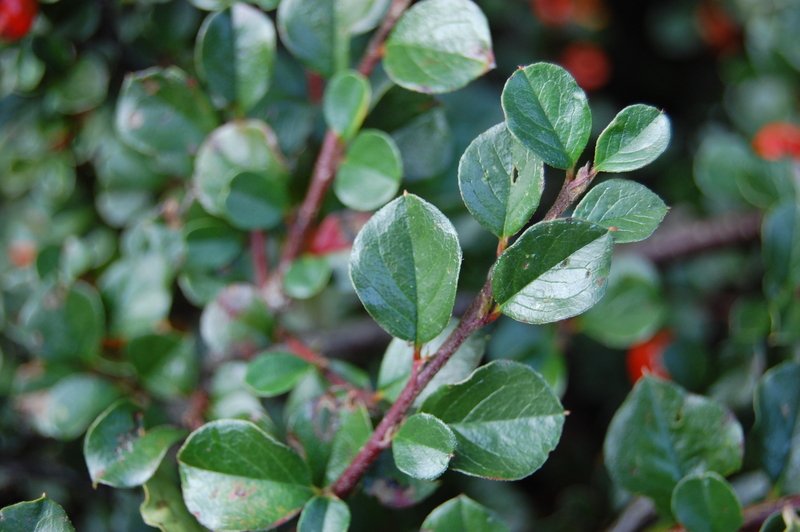 Cotoneaster are hard to id...especially just from a leaf. The pic of your leaves are not very clear. It may be a case of going through every Cotoneaster sp and checking the leaves one at a time..Quote wiki.....".between 70 and 300 different species of Cotoneaster are described "
Best advise I can give is take a sample to a garden centre to see if it matches with the ones they are selling. Its not Cotoneaster " Hybridus Pendulus" or "Salicifolius" or variegatus or C. atropurpureus "variegatus" or Sikangensis so you can eliminate these few. "Cotoneaster x suecicus ‘Coral Beauty’ is a cultivar which is primarily distinguished from the species plants by having: more compact habit; leaves a bit shinier; and more abundant fruit crop." Are the leaves...."Alternate, leathery, elliptic to oblong, mostly evergreen leaves (to 1 1/ 4” long and to 5/8” wide) are glossy deep green above and gray-green below."???? Maybe it is..... maybe it isn't! Cotoneasters are very hard to id...!